Team Bruallen are a dedicated experience and creative Trio of florists. Bruallen was originally opened by Elaine Reynolds in 2004. Elaine has worked with in the industry for 20 years. Elaine and her staff Emma & Sophie are all highly trained in all aspects in a creative floristry. Our local village florist is open 6 days a week and is brimming with beautiful seasonal flowers and plants, both sourced locally and many imported. A daily delivery service is available to the local area including, St.Teath, Boscastle. As professional floral designers we can deliver beautiful, tailor created floral displays with the individual in mind. Wedding flowers are a speciality of the trio. With their creative flair and imagination, all wedding trends and themes are possible. This is highlighted by the number of wedding floristry awards they have won over the years. Local Daily Deliveries to: Delabole, St Teath, Camelford, Boscastle, Tintagel, Wadebridge, Padstow, Rock, Polzeath, St Minver, St Kew, St Breward, Blisland, St Tudy, St Maybn, Bude, Crackington. We are also able to arrange national and international delivery. 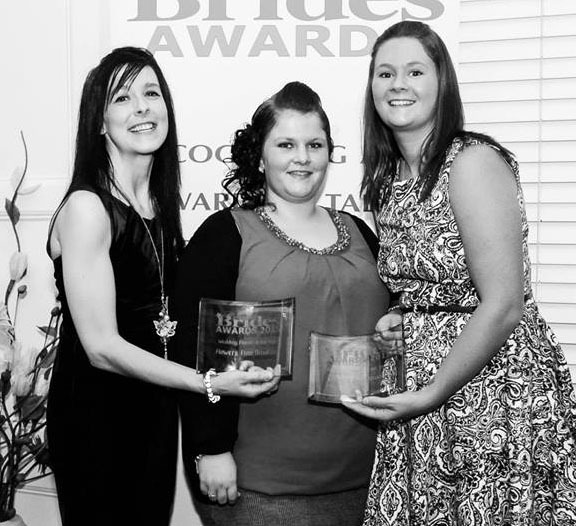 Cornish Brides Award 2014 Winners!